It's not charming, engaging, good for a brand, effective or practical in any way to aim for a social media integration trifecta - all of the time. In other words, if you have Twitter integrated with LinkedIn and Facebook, you are going to make mistakes trying to be everything to everyone in your various networks. You are sure to earn a reputation as a nuisance. There are certain circumstances in which a purposeful trifecta strategy is desirable and appropriate, like job postings, important public announcements (I got a promotion, graduated college, won the lottery and I'm out of here), and information to be shared that you are certain would appeal to those at the water cooler as well as in the boardroom. Tweets like the ones imported into my LinkedIn home page at this very moment by my contacts add zero value taken out of their Twitter context (actually, some have no value posted anywhere). Good Morning! Good Afternoon! Good Evening! Good Night! Good Day! Wherever you are, you can make it "good." Did I just see@temauk on tv at the sugar bowl? I've lost track of #tchat . Waiting for the next question. Rather than connecting Twitter to Facebook via the official Twitter app use Selective Twitter. It's easy to use. When you want a tweet to post to Twitter, simply end it with #fb. This way, your club's tweet chat convo doesn't end up in your Facebook timeline to confuse and frustrate your other friends. It works for fan pages you manage too. If I'm at an event I can post updates and pics with my Blackberry to one of the many fan pages I manage easily to both Twitter and Facebook (I use berTwitter - available for iPhone too). If the content is also appropriate for LinkedIn I can post there too at the same time by adding #in or #li. 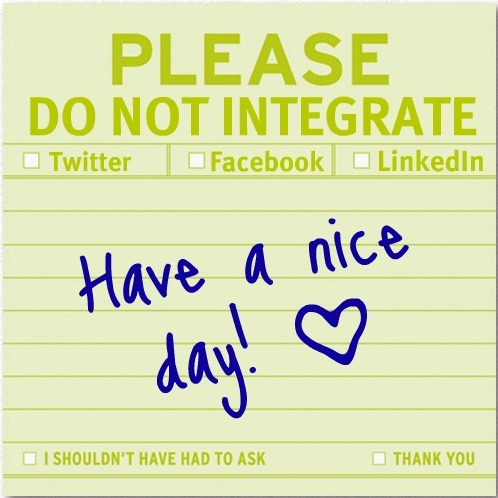 When you configure your LinkedIn account settings to connect with Twitter, be sure to select the "share only tweets that contain #in or #li." LinkedIn's Reid Hoffman and Twitter's Biz Stone made a video to talk about bringing the peanut butter and the chocolate together for maximum effectiveness. Using the two together can be a smart strategy if done the way they suggest. Be sure to send a reminder to disconnect as an ecard to those you know - better yet, forward this post to them!